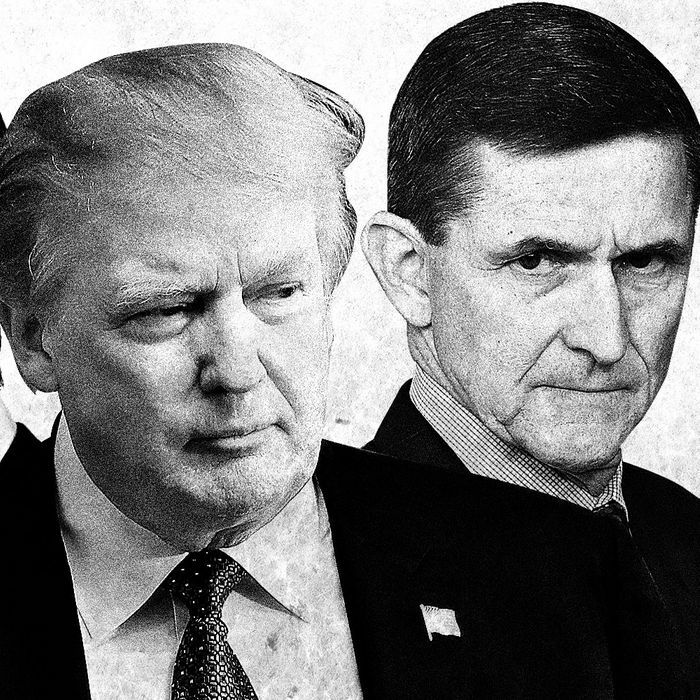 Jared Kushner, Donald Trump, Michael Flynn. It may not have made “sense” for Donald Trump to fire James Comey, let alone for him to proceed to confess — in a public interview with Lester Holt, and then a putatively private meeting with Russian diplomats — that he did so in order to stop the Russia investigation. But the flurry of new reports over the last few days has given the puzzling sequence of events a more coherent shape. Within the warped internal logic of the Trump presidency — where it is taken as a given by essentially everybody around him that the president is impulsive and grotesquely ignorant — his shocking actions and statements have a more understandable basis. All this implies that the probe is scrutinizing the financial aspects of Trump’s business, which is a family operation. While some Trump advisers opposed the firing of Comey, Kushner reportedly advocated for it. That fact may seem strange if one thinks of Kushner as a voice of pragmatism. But it is easier to understand if you think of him as a figure sitting near the heart of a financial scandal, who harbors a strong interest in suppressing the investigation. During his brief tenure, Flynn engaged in breathtaking corruption of his official duties. As national security adviser, Flynn ordered a delay in a key assault on ISIS in Raqqa, Syria. The delay comported with the desires of the Turkish government, which had paid Flynn more than half a million dollars. While largely blotted out by the shock of daily revelations about Trump, in a normal news environment this revelation would have mushroomed into a first-tier scandal of its own. It is hard to think of a historical case in which a major American military action has been influenced so corruptly by a foreign power. Flynn’s downfall took about 24 hours following revelations of Russian ties. And while the broad contours of Flynn’s relations with Turkey and, especially, Russia have been known, the depths have not. One report found Russians boasting privately that they believed they could use Flynn to manipulate Trump. Another report, vindicating the first, reveals that Trump continues to profess loyalty to Flynn. The president regrets having fired him and remains angry at the investigation of his reported misdeeds. Yet another scoop recounts that Flynn told friends that Trump had contacted him after his firing and seemed to encourage him not to to flip. “I just got a message from the president to stay strong,” Flynn told friends last month. What do these new revelations tell us? Flynn’s legal risk, and Trump’s personal investment in him, are both much higher than we understood. And we are seeing that financial corruption is playing a more central role in the scandal. The official White House line maintains — or has tried to maintain — that the administration welcomes special prosecutor Robert Mueller and sees his work as a chance to dispel the cloud of suspicion needlessly hanging over the presidency. Their actions suggest a very different calculation. From Trump’s campaign to ensure the loyalty of his FBI director, to his subsequent firing of him, to his tweet-rages against the special prosecutor as an unfair witch hunt — all of this indicates high levels of panic in the Oval Office. Trump has almost certainly engaged in obstruction of justice for the simple reason that there is a lot of justice to obstruct.